The River Chess faces many threats, most importantly low flows caused by abstraction for the public water supply. With that in mind we are pleased to see that Thames Water and Affinity Water are planning to work together on a new reservoir project near Oxford. It now features strongly in both their new Water Resource Management Plans. The South East Region of the UK is the driest and most populated corner of the country with the highest demand for water. It has been in need of this new reservoir capacity for years and it cannot come too soon. The scheme will allow water to be taken from the River Thames at times of high flows and stored to be used when supply from other sources particularly the aquifer that supplies our struggling iconic chalkstreams is short. In our area domestic supply comes from Affinity Water, of which over 60% is sourced from the aquifer. The aquifer also supplies the flow to our chalkstreams such as the Rivers Misbourne, Chess, Ver, Gade and Wye, all of which have long dry sections and very low flows. We are in the Affinity Central Region and their current estimate of supply and demand reveals that we already have greater demand for water than supply. This is why this joint project between Thames Water and Affinity Water to build a new reservoir is so important to ensure water security for the future in times of population growth and climate change, and reduces our dependence on groundwater for domestic water supply, saving our chalkrivers. This supports the stated aims of Thames Water and Affinity Water to protect these rivers. The River Chess Association is urging DEFRA, OFWAT and the Environment Agency to provide support for this project. There is a concerted message coming from the Angling Trust, Rivers Trust, Wild Trout Trust, Salmon and Trout Conservation Trust and various local pressure groups all working together supporting this project. We could be heading for a crisis this year. Low winter rainfall has meant minimal recharge of the aquifer and our already struggling chalkstreams will further dry up. Less than two years ago we were seeing pictures of a dried up River Colne and it is likely to happen again this year. 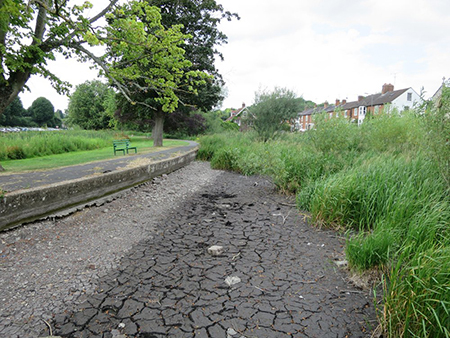 In Chesham, the River Chess has been dry since September 2018; this is the 5th time the river has dried up since 2011. This is why this reservoir project is so important.